Develop explosive punching power for fighting! Throw punches with more confidence and power than ever before. Unload fast flowing combinations without getting tired. And set up angles to land deadly counters! Refine every punch in your arsenal from jabs to crosses, hooks, uppercuts, and over 40 different variations of them! I share all the punching secrets I’ve picked up over the years in this special 30-DAY intensive training program. 8 HOURS of instructional video and a 42-page workbook dedicated to improving your punching technique. Learn OVER 100 killer punching techniques used by boxers to strike with incredible power, speed, and timing! FOREWORD: I am humbled and honored to have you as a ExpertBoxing fan/reader. I’ve spent the last 3 years working on this special course. After many long hours, I’ve arrived at last with something I believe can take any fighter’s game to the next level. It has been a true labor of love and I hope you’ll enjoy it as much as I did making it. Want to have KNOCKOUT punching power? EXPLOSIVE POWER – unload crushing power on all your punches! LIGHTNING SPEED – fire off combinations with blinding speed! DEADLY ANGLES – set up angles to land deadly counter punches! Defense and footwork has never knocked anyone out. Only punching power can do that. Some fighters have never felt what it’s like to have A-level punching power. It’s not only the ability to punch hard, but the respect that comes with it. Everyone notices you. People turn their heads every time you hit the bag. All the parents, girlfriends and little kids standing around the gym keep watching you train because you look like you can really hurt somebody. And for some reason, no matter what gym you visit, EVERY trainer wants to work with you. Your opponents respect you more, too. They get nervous when they see you warming up on the mitts. Their coaches worry about putting them in the ring with you. Their game plan always changes to “stay away and jab more”. They keep a distance more. They don’t rush you as much. It’s like you’re carrying a baseball bat into the ring. Knowing that you can hit hard gives you confidence and security! You don’t worry about another fighter’s punches when you know you have more power. Fighting is way more fun when you can bang. People get hurt when you touch them. They flinch, they back off, they groan, or they go down. You can even take on bigger opponents. Everyone remembers your punches and you get a reputation for being “that guy”. Do you want to WIN fights? 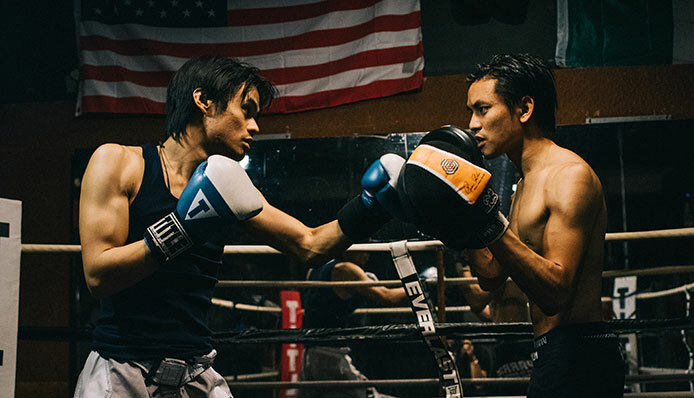 Aside from the respect, punching power makes it easier to win fights. You can get the job done with LESS EFFORT and LESS RISK. You get to relax more, even use less energy. Instead of swinging wildly and leaving yourself vulnerable, you can be just as dangerous relaxing from behind your guard. Imagine having jabs that can break noses, right hands that put opponents on the canvas, hooks that crack ribs, and uppercuts that chop heads off. Power can also push opponents off balance or hurt their arms (or even dislocate shoulders) when they block. Having power makes you dangerous even when you’re tired. Whoever has the power, controls the pace. Punching power also helps your boxing strategy. It can keep aggressive guys at a distance, slow down faster opponents, make power-punchers shy, or make defensive guys even more defensive. Punching power makes opponents stop and think. They don’t throw as much when they’re worried about defense. How far do you want to go with your boxing? No doubt about it—champions tend to have more power, but it’s not only this. To reach the elite levels in boxing, you need to be proficient in every skill set. And having punching power frees up your time to develop these other skills. Instead of focusing on power, you could be working on your angles, defense, and footwork. It’s easier to work on higher-level boxing skills when you’re not busy worrying that you don’t punch hard enough. It’s also easier to fight intelligently when opponents respects your punching power. At the end of the day, many boxing skills fall under the same universal principles. The same skills that give you a great offense can also give you great defense. The athleticism used to generate punching power can also generate balance and foot-speed. Mastering any area helps you improve in all other areas. Where does REAL punching power come from? Punching power comes from technique! The best punchers have the best punching technique! Some might have had great genetics, while others may have had great trainers or great training. But ultimately, they all have great technique. There is something beautiful in the way that they punch. The punches look clean. Everything is strong, solid, and supported. There’s no pain, no awkwardness or weird movements. Every punch lands with 100% pure energy transfer. Does this mean I’m saying that athletic ability or physical conditioning don’t matter? Absolutely not. I’m simply stating that technique comes first. All you need for a powerful punch is a little effort applied from an effective position. You won’t have to do much if you’re in the right place. You could relax and still hit pretty hard! The best punchers can hit hard even without trying. I like to categorize physical training into two levels: the first level is what I call “low-skill physical training“. For me, this is your basic strength & conditioning work. It’s got cardio, some strength-training, some endurance work, and basically an all-around total-body workout. This low-skill level training is great for getting you into fighting shape, but isn’t likely to be the thing that helps you break punching records. The second level is what I call “high-skill physical training“. For me, this is any kind of physical training that focuses on muscle coordination rather than muscle exertion. I’ve referred to it before in various ways: muscle coordination, muscle timing, muscle habit. Let’s call it, “muscle memory”. The first time you learn a movement, your mind has to think it through numerous times before your body can do it. After enough repetition, your body remembers this coordination and just fires everything together without you even thinking about it. Having muscle memory not only takes less mental effort, but also less physical effort. Have you ever seen those old out-of-shape retired boxers that can still hit hard? Or how about the pro who hits 3 times harder than you do while using only a fraction of effort? How is that even possible? THIS, my friend, is the magic of “muscle memory”. Once the movement patterns are ingrained in your body, you’ll always be in perfect alignment. A great example of “muscle memory training” would be shadowboxing, or high-skill mittwork like Mayweather’s pad routines. Training with lots of conscious thought and body awareness is far more beneficial to a fighter’s development than wailing away on the heavy bag. Many beginners will never develop the fine coordination because they’re so busy trying to throw punches harder and harder. Power alone isn’t going to cut it against trained opponents. No one stands around with their chin in the air, right? Smart opponents will be moving all over the place, attacking and countering from a billion angles. So guess what, this means you need to know how to punch from many angles as well. You’ll also need timing, to be in the right place at the right time in order to land your shots. Without understanding how to use timing and angles, you’ll always be a step behind. It’ll feel like you’re punching at something that’s always covered up, or always running away. You’ll spend all your energy but never hit a clean target. with timing and angles than it does with power. Punching at the right time actually causes MORE DAMAGE to moving opponents (by using their momentum against them). Punching from the right angle not only hurts them even more but also keeps you safe from their counters. What’s the best body type for punching power? Incredible punching power can come from ANY body type! I can honestly tell you that I’ve seen power come from all body types. Tall, short, muscular, slim, big arms, skinny arms, thick legs, chicken legs, etc. The beauty of technique is that it works for everyone. Put your body in the right position, crank a little and *BOOM! * Technique really does all the work for you. Most boxers will never get access to quality boxing instruction. Many boxing gyms (if you’re lucky to find one nearby) will only have a few trainers. And the trainers are always busy with their top fighters, their sons, or the guys who already have natural power. For everyone else, they show you a few punches and that’s it. So unless you’re a spring chicken with Olympic potential or pay a lot of money, you’re most likely not going to get the best training possible. If you’re either a beginner, adult-aged, female, fitness client, or any other kind of everyday-person, you’ve probably been left unsupervised during a training session at some point. The trainer shows you a few combos on the mitts, and then abandons you on the bags while he prepares his top fighters for their weekend matches. This isn’t to say that the trainers care little for your progress; they’re simply busy multi-tasking and focusing more on their prized fighters. Fair enough. Some trainers won’t even correct you. They’ll just assume you’re not a “natural”. Aside from the lack of quality time with an experienced trainer, there is also the issue of only having one viewpoint. Most of you will never get to learn from more than one trainer and so you’ll only be exposed to one style and maybe even be taught that other styles are “wrong”. The worst part of all is that many trainers won’t even try to figure out your problem if you don’t hit hard. They’ll just assume you’re not a “natural”. The first problem with punching technique is a lack of core involvement. 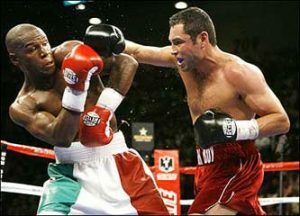 Many fighters cannot generate powerful punches because of poorly-developed muscles, poor technique, or poor positioning (of the body). Lack-of-core is common because trainers teach by showing the FORM of a punch. Which means you learn to throw punches based on how they LOOK, rather than by how they FEEL. Poor positioning is common because fighters often inadvertently take their body out of alignment when attempting to be more offensive, defensive, more agile, or to copy their favorite fighters on Youtube. Without integrating your core properly into every punch, you’ll never be able to generate the maximum power possible. You CAN still throw a very hard punch, but it would take far more effort and unnecessary movement which come with serious drawbacks. You could lose balance, waste energy, or throw slower/wider punches that leave you vulnerable to counters. Keeping their core engaged, the best punchers can move and punch powerfully without requiring extra effort or preparation time. This allows them freedom to move around instead of being stuck in one position for the whole fight. The second problem with punching technique is a lack of impact stabilization. You can generate all the power in the world but it won’t transfer if your body doesn’t stabilize during impact. Poor impact stabilization is the #1 cause of a power leak. Many fighters will generate tons of power just fine. But then something happens when their fist makes contact—instead of holding the alignment, a joint falls out of position. Maybe the hip is pushed out, or the shoulder is out of place. Bones (and joints) TRANSFER power. Fighters who SEEM to have good punching technique but still lack power are probably dealing with this problem. You might have strong muscles and hear a loud *BANG* when the punch lands but little power will transfer if your joints don’t hold stable. Punching with your joints out of alignment not only decreases power but could also hurt your joints (hand/shoulder). The best punchers know how to position their body during impact to transfer power cleanly. They know exactly how to activate the right muscles and control their joints, to prevent the usual “power leaks”. The third problem with punching technique is a lack of punch variation. Many fighters are unable to use their power because they don’t know how to throw punches from different [realistic] positions. It’s unlikely for fighters to know many ways of throwing punches because 1) trainers won’t teach them other variations until they master the basic ones, and 2) trainers may have their own style bias and shun other variations as being “wrong”. The problem with throwing punches the same way every time is that your attacks start getting predictable. Unable to land punches, fighters will inevitably invent their own “tricks” and unique ways of throwing punches (usually by taking their body out of position). These creative punch variations may be crafty enough to score but are often not strong enough to cause serious damage. The best punchers always have more than one way to do something. They know 10 ways to throw the jab, 10 ways to throw the cross, hook, uppercut, etc. If you were to count out every possible variation, they would probably have over 100 different punches. The best punchers will also know the strengths of each variation instead of being confused by conflicting ideologies or blindly believing that only one technique is the “best”. 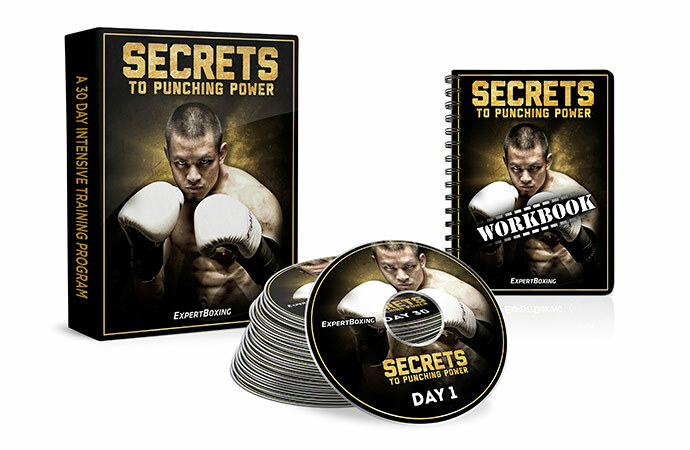 What’s inside the “SECRETS to Punching Power” training program? You’ll get access to a comprehensive 30-day training program with 8 hours of video. You’ll learn many new punching methods, drills, exercises, and secret tips each day to completely transform your punching technique and maximize your punching power. I guarantee you will punch harder, faster, and with better timing than ever before! The most detailed punching technique program….EVER! Nothing like this exists anywhere. (I know because I looked.) This level of detail isn’t found in any gym or anywhere on the internet. In fact, I doubt anybody has ever learned or taught it this way. Typically, this kind of knowledge is acquired through years of training in different gyms, learning from different trainers, and sparring with different fighters. That’s pretty much how I learned it. However, it’s hard to get access to that nowadays. So if you don’t have access to multiple gyms, trainers, and sparring partners, it’s honestly really hard to pick this stuff up. Many of these moves are commonly used but they don’t have names. Everyone just assumes that once you get to the competition-level, you pick it up magically somehow. But what if you don’t want to wait all the years and go through all that? I hate to use the word ‘shortcut’, but here is one of the FASTEST shortcuts to take your game to the next level. Techniques, drills, examples, and lots of explanation! I recorded hours and hours of video, explaining concepts in various ways and showing movements from multiple angles. We’ll be exploring a hundred new ways to throw punches. You may have seen some of the variations, but I highly doubt you’ve seen ALL of them. You’ll get to see techniques up close, on the bag, as well as on a live person. Tons of punching tricks and secrets! 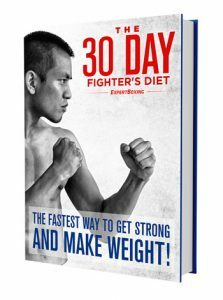 I’ve picked up hundreds of fighting secrets over the years and I bare it all here. A few of these tips might be stumbled upon by accident through years of experience. But many of them are truly impossible-to-discover gems! And can only be passed down from someone who’s already been there. This isn’t the usual 20-point checklist style of technique, where you have to remember a million details (the fist, the shoulder, the hip). I’m talking about simplistic technique! I’ll say, “do this one little thing with your back” and you feel the difference in your body right away. There’s no fluff or long complicated drill process. Every tip is so golden you’ll be itching to try the next one. I’ve even had people tell me certain tips alone were worth the price of the entire course! A complete course on punching technique – POWER, SPEED, TIMING, RHYTHM, ACCURACY! Improve your technique in every single way—NOT JUST POWER! Speed gets punches past defenses, and returns your hand quicker (for defense or to punch again). Timing increases punch impact and also creates opportunities against defensive opponents. Rhythm gives your combinations flow and efficiency. Accuracy maximizes damage and increase the chances of a knockout. but also how to LAND knockout punches! A real lesson on punching power isn’t complete until you know how to LAND your punches. The final days will cover the most difficult skill of understanding timing and angles. This is literally THE skill needed for landing KNOCKOUT PUNCHES! 8 HOURS of video – nearly 480 minutes of technical instruction broken down into a 30-day intensive training program. Learn the secret techniques and over 100+ punching techniques to improve your punching power! 42-page workbook – all the punching variations, exercises, and tips conveniently listed in a helpful PDF. Print it out, follow along, and make notes. NO SPECIAL EQUIPMENT NECESSARY – it’s most ideal to have a punching bag or a partner holding mitts in order to feel the difference, but you can still learn even if all you have is your body and nothing else. THIS IS A DIGITAL PRODUCT – no physical items will be shipped. 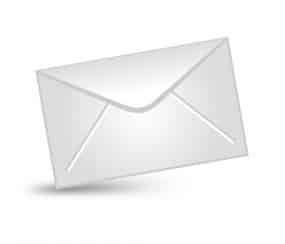 You will instantly receive a member login in your email after purchasing. The videos can be viewed online, downloaded, or converted to other media. “Welsh champion in 2014, finalist in 2015. 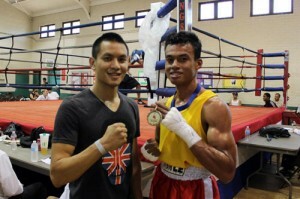 Had 21 amateur bouts (won 19, lost 2) and got 2nd pro fight in 3 weeks time. Apart from being involved in so many gym sparring/training with world class amateurs and pros, ExpertBoxing probably played the biggest role in my career as I was following the tips, corrections and little adjustments through the last 5 years of my career. Funny enough sometimes in changing room before a fight, instead of listening to the trainer I was thinking about all of Johnny’s advices and stuff and it’s even more funny that it usually worked. Warm-Up Routines – routines for warming up your muscles and joints. The #1 GOAL of warming up and how to do it properly. Warm-Up Mistakes – common mistakes fighters make when warming-up. Balance Principles – neutral axis awareness and strengthening your fighting stance. Weight Placement – standing on the right part of your feet for balance and power. Stance Mistakes – common body positions that weaken your stance and punches. Relaxed Power Theory – fundamental principles on creating power through relaxation. 3 Types of Power Exercises – to improve punching power. Importance of Shadowboxing – how it develops punching technique and makes you a more natural puncher. WHY – the jab is the most important weapon in boxing. Advantages of the JAB – and its main strategic goals. Jab BASICS – technique and form. Jab Elbow Extension – understanding how the left elbow extension and rotation affects your jab. Elbow Extension Drill – one SIMPLE drill to know if your elbow is extending properly (without “winging” or “delayed support”). Left Shoulder Pop – using it to add power and protect your chin. Jab POWER – where the jab’s power comes from and the easiest way to generate it. Body Alignment – how to put more of your body weight behind the jab. Jab Telegraph – addressing the telltale signs to prevent your jab from telegraphing. Jab Variations – different kinds of jabs and the various boxing strategies to utilize them. Step-Jab Variations – different kinds of step jabs for probing, attacking, or making space. Jack Dempsey’s “falling step” technique – how to stack your body during the “fall”. Whipping Jabs and Flicker Jabs – playing with the height and extension of the elbow. Why flicker jabs feel more natural for some fighters. BACK-step Jabs and RIGHT-step Jabs – create angles with the step jab for defense or countering. Pivot Jabs – using the pivot jab offensively and defensively. Creating different angles using weight placement. Reaching Jabs – to add power, reach, or set up the classic “pull-counter” trick. Touch Jabs – to distract opponents and set up bigger punches. Pushing Jabs – to off-balance and frustrate opponents. Jab to the Body – different ways to throw jabs downstairs and the best timing for them. Up-Jabs – to split opponent guards and the head movement to set it up. Double Jab Movement – moving with the double-jab to set up different punches and attack rhythms. Timing the Elbow – to increase jab force and stability during punch impact. Proper Forearm Position – for straighter, stronger, snappier jabs, and more support. SHOULDER Jabs vs LAT Jabs – different ways to generate power and set up angles. Head Movement Tactics – to avoid getting countered, and also set up different attack angles and bait strategies. Why NOT to twist or pivot during a jab – the problems it creates and how they affect your follow-up right cross and left hook. ADVANTAGES of the Right Cross – all the things the right cross can do, as well as it’s vulnerabilities. Right Cross TECHNIQUE – proper form and rotation in your hand, arm, shoulders, torso, hips, and back foot. Rotation Balance – body alignment in the right cross and technical mistakes to avoid. Right Leg PIVOTS – that add power, rather than lose power and get off-balance. Exposing the myth behind “shifting weight”. Leg CATCH – natural timing and rhythm to propel your body weight into each punch. The “SHOULDER POP” – releasing the shoulder for that “pro snap” on your rights. Knee BEND – how bent (or straight) your legs should be for maximum punching power. STRAIGHT right vs RIGHT cross – main differences in technique and strategy. Straight Right Visualizations – arm adjustments for sharper, cleaner power. Also, setting up straight rights with your jab. Changing the Wrist Angle – to curve overhand rights around different types of defenses. Using head movement to set up the overhand right. Elbow Placements – for more power during overhand rights. “IN-PLACE” Right Hands – cat-like pro move, great for getting knockout counter-punches while moving backwards. Head & Eye Control – to avoid telegraphing body attacks. Best timing for right hands, and the #1 mistake when throwing right hands to the body. Right Hook to the BODY – 2 angles for right hooks to the body, and the head movement strategy for each one. Setting Up Lead Rights – to make them faster, trickier, and create escape opportunities. Knee STABILIZATION – positioning the right knee for power rather than a power leak (common mistake). Axis Placement – different body weight placements for power and strategic purposes. Staying Balanced during WEIGHT SHIFTS – understanding where your right arm should be depending on where your weight is shifted. Head Movement with the Right Hand – to create attack angles and avoid counters. BLIND Right Hands – how and when to throw “no-look” right hands. ADVANTAGES of the Left Hook – key front hand weapon for getting around opponent defenses, trick punches, body shots, knockouts, and setting up your right hand. Left Hook TECHNIQUE – set up, pivot, turnover, and shift weight perfectly. Left Hook Power Generation – where the left hook’s power comes from. Understanding the 3 places that generate power on the left hook. POWERFUL Weight Shifts – shifting weight powerfully and quickly without swinging yourself off balance. Spine Position – avoiding the common mistake of putting your spine in the wrong place that makes you lose power/balance. Left Elbow Angles – best elbow positions for power and support on your hooks. Left Hook VARIATIONS – thrown from different positions, weight distributions, and angles. How they set up different punches, movements, and overall boxing strategy. Head Movement Strategies – set up punches or escape routes with your left hook. Shifting Strategy – why it’s OK to break rules in shifting weight for the left hook. HORIZONTAL Fist vs VERTICAL Fist – their differences in range, angles, and how they get around opponent defenses. Left Hooks to the BODY – painful body shot that debilitates opponents, slows them down, takes away their legs, and even causes knockouts. The “Back Line” – best position (for power and reach) for body hooks, without telegraphing or leaving yourself vulnerable to right hand counters. Double-Hooks – throw multiple hooks without feeling slow and awkward. (HINT: it’s all in the weight shift). Exploring angles and rhythm to confuse opponents. Optimum Shoulder Range – establishing your left hook range in relation to your shoulder angle. Avoid “breaking the shoulder” to reach out of range. 4-Point Contraction – synchronizing 4 muscles together to maximize structural integrity and power transfer. “Back Swing” Technique – this is the MOST POWERFUL technique for left hooks. Commonly used by pros but almost never taught in boxing gyms. Understand why it’s so much stronger and balanced than the inferior “forward swing” technique. Wing Curve – helpful visualizations of “curving energy around your body” during the left hook to maximize power. Front Hook Dig – dig your body weight into THIS PART of your foot to get incredible power and stability on your left hooks. Left Hook RELEASE – the natural “arm release” method for more speed and power, without exposing yourself or tiring your arm muscles (common mistake). ADVANTAGES of the Uppercut – in power, angle, trickery, close-range use, and also getting around opponent defenses. Basic Uppercut Technique and Form – proper technique for arms, hips, legs, and staying compact. Avoiding mistakes in arm angle, weight shift and hip position. Uppercut Power Generation – using your legs to make uppercuts powerful and fast in combinations. Doing it wrong slows down your uppercuts and decreases balance. HIP Placement – the easiest way to make uppercuts several times more powerful. Shifting vs NON-Shifting Uppercuts – how they generate power differently and set up different attack angles. Elbow Angles – changing your elbow position to uppercut from different angles. SHORT vs LONG Uppercuts – for fighting at different distances. Uppercut Adjustments – to make them looping (to curve AROUND a guard) or straighter (to penetrate THROUGH a guard). The “Shoulder Rule” – the MOST important rule about aiming uppercuts, and why throwing them outside of this range is not only weaker but exposes you! Uppercut TWIST – mastering the “under twist” movement in the uppercut, and using this concept to generate knockout power with only a few inches of space. The “Up” Myth – the fallacy of the “up” movement in the uppercut, and how redefining this upwards projection makes uppercuts more compact and powerful. Head Placement – MULTIPLY your power by understanding how head position affects the uppercut. The “Back Angle” – find the secret angle (in just 3 simple movements) to throw the most devastating uppercuts from any position! Uppercut Stability – lining up your joints to properly reinforce your uppercuts. Uppercut Weight Placement – knowing where and how to sit down on your uppercuts, to ground you like a rock and let you crank power like never before! Uppercut Weight Shift – shifting weight correctly (and exactly how much to shift). Advanced Concepts – universal power principles that maximize power in all positions (even from “bad positions” or with “bad technique”). Analyzing where power really comes from and how to create it from anywhere, anytime. Raise body awareness. Perfect Arm Position – the EASIEST WAY to improve speed and stability on every punch. Get your elbow into the right position every time without over-thinking it. Leg LOAD – how to load your legs on every punch to increase power without slowing down your combinations or losing balance. Avoiding the “reset problem”. The “HIP DROP” – how to drop your weight into each punch, and keep the power line stacked to transfer force from the ground through your body. Core Activation – be stronger in all positions without becoming stiff or losing mobility. Push Control – the right amount of “push” to transfer power, without losing the snap or fatiguing your arm. Chest Presence – torso alignment for solidity; defend without hollowing your punches. How to prep your upper body and arms before punching for more relaxation and mobility while also increasing power. “Back-Side” Power – generating power from the back side of your body (back, hamstrings, lats, glutes) instead of the front side (chest, arms, quads). CLOSED Rib-Cage – preventing power leaks through the rib-cage during punch impact. SNAPPING Punch – the classic boxer’s technique for POWER, SPEED, and EFFICIENCY! Understand snap timing, when to extend and retract, and guaranteeing the power transfer. SNAP Punches vs PUSH Punches – differences between snapping punches and pushing punches. Snapping Punch Visualizations – alternative ways of visualizing how your body and arm muscles sync together to fire with the right timing. OFF-Rhythm Attacks – disrupt your opponent’s timing and land surprise punches. Learn to punch off-rhythm WITHOUT losing your own timing! Heavy Bag TRAINING – helpful tips and training methods to develop good punch technique (and fighting habits). No more “blind punches” on the heavy bag! Upper & Lower Sync – allow your natural strength to flow by moving the upper and lower body together. Find your body’s natural torque, rhythm, and alignment. IMPLOSIVE Punching Theory – exploding your energy inwards instead of outwards for more solid power, balance, energy transfer, and overall body support. Arm Tension Control – for better speed, relaxation, and power transfer. Master the “release” to get that full snapping power on your punches. BODY Release – release punches with your body instead of your arms, to increase power and also conserve arm endurance. Becoming HEAVY – develop that solid, grounded feeling like the pros and older boxers. The “old man strength” gives you power and prevents you from getting pushed back. Spine Presence & Control – keeping your spine in the right place during punches. Avoiding the mistake of taking your spine out of position in order to block punches. Axis Placement – precise weight distribution over your foot to engage more muscles during the weight shift (and strengthen your movements). ELBOW-LAT Connection – unifying the elbows and lats to have the best of both “arm punches” (snappy arm speed) and “core punches” (power from the core). PELVIS POSITION – controlling your hips to add stability to any fighting stance, body movement, or punching motion. EASY Speed Method – speed up your punches effortlessly, while using LESS technique. Learn how to FEEL lightning fast. Speed Breathing Techniques – to help you move faster and punch faster. WEIGHTLESS Arms – whereas many fighters try to punch faster by pushing with more effort, this method moves your arms faster by making them feel “lighter”. Efficient Arm Carrying – techniques, positions, and visualizations to help you carry your arms in the boxing stance with less effort. Speed Release – special punch technique that increases speed with less effort. The Art of Light Punches – fighting techniques and strategies using lighter punches to set up your bigger and more powerful punches. “WHIPPING PUNCHES” – how to get the whip effect with your arms for more speed and snap, while using less energy. SPEED Training – interval drills to build up muscle burst and endurance conditioning for great hand speed. Training Mistakes – Beware of the typical training mistakes that decrease your speed training effectiveness. Basic Footwork Theory – combine footwork with punches to be more aggressive AND elusive. Footwork with Jabs – using the natural footwork rhythm to jab with each step. You can jab powerfully with front foot steps, back-foot steps, and also pivots. PRO-Style Walking Jabs – and how to use off-rhythm timing to land unexpected jabs. Footwork with Left Hooks – throwing left hooks with pivots, dashes, and step-ins. Using different hand angles and timing to land punches while avoiding counters. Footwork with Right Hands – 3 different ways of moving with the right hand for speed, power, and unpredictability. Exploring pivots to create attack angles or even turn southpaw. Follow-Up Angles – creating follow-up punching angles by combining footwork with any of your punches. Stance Anchoring – learn to anchor your body to the ground powerfully for rock-solid balance. And also how to SIT so you can root further into the ground while punching. The ART of Walking – relaxed footwork technique that saves energy AND masks your attacks. Use the natural walking rhythm to throw powerful punches at any moment! Walking Slickness – understand why some fighters miss out on this incredible skill because they don’t how to stay in “punching position” without lifting their fight. Footwork for Lead Punches – footwork strategy and technique to surprise opponents. Head movement to avoid counters while coming in (and coming out) with risky shots. IN-and-OUT Footwork – 3 basic principles to moving in-and-out of range quickly. And exercises to practice POWERFUL in-and-out movement (while staying relaxed). Footwork Mistakes – that make fighters use more energy and wear out their legs quickly. Muhammad Ali’s FLOATING Jab – why this is such a powerful mobile jab, and the different boxing tactics you can execute using this technique. Narrow stance – why it actually has more balance and power than a wide stance! (HINT: it’s not just putting your feet closer.) Change how you look at power generation. 5 Moving-Punching Drills – learn to move while punching WITHOUT losing power. CRUCIAL skill for chasing down mobile fighters (or running from aggressive fighters). Mittwork Drills for Footwork – developing good footwork habits while punching and counter-punching. Beware of various mistakes that can develop bad habits. SWITCH-Stance Strategies – to help you find angles, counters, and know what to do when you momentarily switch to southpaw (or vice versa). How to Improve Your Punch Combinations – more power, speed, rhythm, flow, all WHILE USING LESS ENERGY! Combination Fighting Mentality – convert your mindset from “fighting in combinations” (instead of “fighting in punches”). A true “combination fighter” can fight with more flow and immediately adjust his movements during an exchange. Combination Flow Principles – smoothly connect punches together. Feel the difference between a true FLOW COMBINATION puncher from a SINGLE SHOT puncher. Combination Rhythm Principles – to maximize flow, punch impact and energy-efficiency. Combination Breathing Technique – better breathing methods to help you flow, relax, and save energy when throwing combinations. Knowing how to breathe for multiple explosive movements also helps your footwork, head movement, and overall agility. LESS Technique – throw great punches WITHOUT having to worry about every bit of technique. Punch faster and flow effortlessly with just this one detail! Circular Flow Technique – improve combination flow by using one energy to throw multiple punches instead of generating new energy for every punch. FLOWING Snap – exercises and drills to help you throw snapping punches with a “smooth snap” instead of a “jerking snap”. Natural Bounce Return – avoid snapping your punches the “wrong way”. Use this exercise to retract your hand faster after every punch (without losing power). Internal Rotation – generate power using the more powerful INTERNAL rotation (spine), instead of the weaker EXTERNAL rotation (shoulders). Killer Punch Combinations – next 3 days will focus on tweaking combinations for maximum POWER and DAMAGE. Exploring the possibilities of each combination, generating power in different ways and attacking from different angles. Jab-based Combos – today covers the shorter jab-based combinations. 1-1 (double jab) – how to generate more power and snap on each jab. Proper body position to get maximum snap and power on each jab. 1-2 (jab, cross) – four variations of the 1-2 with different possibilities for speed, power, attack angle, footwork, and exit strategy. 1-1-2 (double jab, cross) – mix up various attack rhythms with your double jab to set up opponents for your right cross. Here’s a quick tip to help you keep this combo clean! 1-3 (jab-hook) – a great trick combination (using the hook) to surprise opponents expecting another jab or right hand. Set up the hook by attacking off-rhythm, faking a movement, or sneakily changing your left hook to make it undetectable. Classic combos – tips and techniques for longer and more difficult combinations. Find EVEN MORE angles to place your power! 1-2-3 combo – basic punch combo, versatile enough for any situation (gives you lots of speed and power with very low risk). Has 2 common axis positions, with many subtleties for offensive and defensive purposes. 1-2-1-2-(3) – classic blitz combination, using fast straight punches to surprise opponents and exploit openings. Learn how to be aggressive (but NOT predictable) with this simple combo. 1-2-3-2 – classic “Mexican style” combination, the MUST KNOW combo for being aggressive. What areas to focus on in this combination, different timings and rhythms to be more aggressive, and getting into position faster to land your power punches. Learn the right position that lets you land big rights and hooks while making you a more elusive target to hit. 1-2-3-2 – classic “Mexican style” combination. This MUST KNOW combo puts you in position to land big rights and hooks while still being hard to hit. Learn the timing to make this combo extra deadly. 1-2-5 – classic defense-busting combination for penetrating defensive opponents. The TRICK is to make opponents expect a left hook, and then surprising them with an uppercut! Mix with the 1-2-3 and threaten from multiple angles for maximum confusion. 2-3 (follow-up) – powerful short combination often thrown as a counter, as a follow-up for other combos, or even on it’s own as a trick combo. You can get in and out of this combo using different set-ups, level changes, and footwork. 2-3-2, 2-5-2 (transition combos) – another short punch combination pattern to be used on it’s own or as a transition into other combos. Check out the all different angles you can find at short and long distances. Wide Combos – utilizing wide curving punches such as overhand rights, wide hooks, and uppercuts. 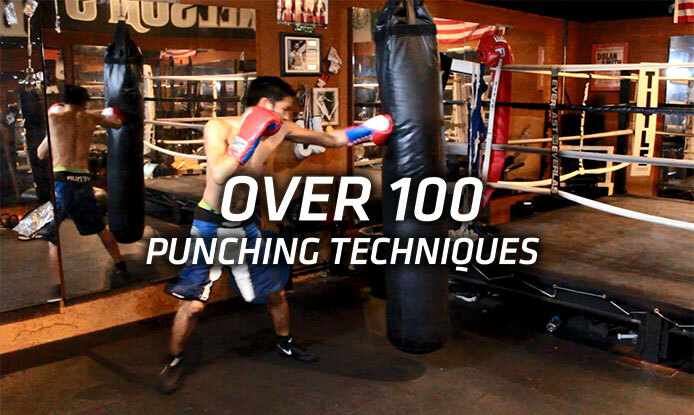 Master the tactic of distracting opponents with straight punches to set up curved punches. 1-4 (jab, overhand right) – simple combo using what LOOKS like “bad form” on the right hand, and yet pros get knockouts with it all the time. Confuse opponents with body movement, and then surprise them with one of the many overhand right angles. 1-6 (jab, uppercut) – starting combination for landing uppercuts. Try out different angles to the head and body, and then transition into other punches after your uppercut. 1-6-5-2 – standard combination putting together 2 uppercuts. Attack from different positions and alter your power distribution to confuse opponent defenses. This combo has great angles for close-range. Double punches – technique for throwing consecutive punches from the same side, and mixing them into your combinations. Great tactic for surprising opponents with unexpected angles and punching rhythms. Knockout Angles & Strategy – 3 days of mastering the most important punching angles for knockout punches. (And the fighting strategies needed to set up opponents for these angles.) You have the best chance of knocking opponents out cold when countering, using their momentum against them! Jab – usually not strong enough to get KO’s but definitely strong enough to do damage and set up your bigger punches. Learn the countering positions that open up opponents for your most powerful jabs. Jab Push – clever tactic using the jab to push instead of to punch. Make opponents block so you can push them off balance to gain ground or set up punches. This move frustrates many fighters and can even cause mobile fighters to become stationary. Right Cross – many secrets and techniques to mastering this powerful shot. First, learn to recognize your opponent’s most vulnerable head position. Then learn to wait for the timing or even create it yourself with baits, head movement, and footwork. Avoiding Right Cross Counters – learn how NOT to get knocked out by a right hand. Being cautious of your most vulnerable head positions and how to throw punches with less risk. Right Cross Counter AGAINST a Jab – secrets to the most common power counter for the jab. Bait specific jabs out of your opponent using subtle head movements, and then counter with the right timing on your cross. Right Cross Counter AGAINST the Left Hook – classic catch-and-throw tactic that caused many knockouts in boxing! Learn the blocking position that lets your right hand counter immediately. It’s nearly impossible to defend when opponents aren’t ready for it. Right Hand Trade – the deadliest (and most common) knockout counter punch in boxing! Positioning, head placement, and exact timing to land the hardest head punch you can ever throw. Feel confident trading with aggressive opponents! Crouched Right – bait opponents with tricky crouching positions to set up nasty counter rights. Understand how crouching confuses fighters and using this psychological ploy to bait them into vulnerable positions. Concealing Body Shots – simple tip to hide your intentions and prevent opponents from knowing when you’re going to the body. Avoid making it obvious! Knockout Left Hook Counters (using HIGH-elbow) – great counter for targeting the chin, temple, and ear. Learn positions, weight shifting, and hook release methods for different distances. High-elbow left hooks can counter almost any punch. Knockout Left Hook Counters (using LOW-elbow) – great counter for targeting the chin, body-FRONT (stomach, solar plexus), or body-SIDE (ribs, liver). IMPORTANT: head movement tactics to avoid right hand counters when your left drops for the hook. Left Hook Trade – the 2nd most common KO punch. Just don’t get knocked out by HIS left hook. It’s not only about keeping your right hand up but also controlling your weight shifts. Sideways-Angle Hook (aka “left swing”) – a powerful but risky punch to throw. Surprise opponents using this hook variation as a lead, or also as a counter. Left Hook Counter AGAINST a Right Hand – exposing an opponent’s vulnerabilities during his cross. Learn several ways to hook around his right arm for different targets. Knockout Right Uppercut – throw crushing uppercuts from various positions on the inside and outside. Learn a SPECIAL TIP to help you crank as much power as possible. Knockout Left Uppercut – throwing deadly uppercuts from the left hand now. Move your head to this ONE KEY POSITION to generate maximum power. Uppercut Timing – natural timing for knockout uppercuts. (No more waiting forever or forcing the shot.) Opponents are more vulnerable to uppercuts than you think! Orthodox vs Southpaw Punching Angles – the difference in boxing positions and angles when facing left-handers (or fighting as one). Classic 1-2 Variations against SOUTHPAWS – principles for throwing jabs and crosses against southpaws. Winning the awkward jab battle, and strategies for landing your rear hand while avoiding his. Footwork against SOUTHPAWS – getting into position against southpaws (instead of always tripping over his front foot). Aggressive Positions against SOUTHPAWS – attacking from the forward-axis punching position. Different timings to get into position, land your shots, and target areas you can aim for. Aggressive 1-2 – attacking (or baiting) from the forward axis angle. Try different timings for your cross, and aiming at different targets. KO Front Hook against SOUTHPAWS – footwork to get past his jab and put your shoulder into the natural hook angle. Hook at different targets depending on his attack. Mixing Hooks & Uppercuts – sneaky tactics to switch between hooks and uppercuts (as well as head and body shots) WITHOUT being detected! Uppercuts at Close and Long Range – uppercut strategies for different distances, and the accompanying head movement to keep you safe when you throw. …WHEW! Have you had enough?! PS: Still have questions about “SECRETS to Punching Power”? Leave a comment below or send me a direct email and I’ll answer it right away. It’s an incredible course with MANY benefits. Find out for yourself. 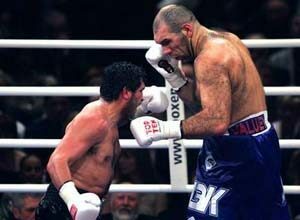 How Do You Beat A Taller Boxer? Really cool looking stuff Johnny, appreciate all the hard work and effort you’ve clearly put into all this. Love all the sparring footage you’ve got in the intro video as well. Thanks for the support, Noah. It’s been so much hard work and I’m glad to finally release it. More FREE STUFF on the way, my friend! I really appreciate the gesture, my friend. I’m not sure that’s something I want to tackle right now as I’d have to translate all the information pages and member/account pages. If there was any way to see if there was a real demand for it, I’ll reconsider it again. Hi Johnny. Long time , no talk my friend. I was just wondering if I can get a discount on Secrets to Punching Power ? The reason why I ask is because I have all of your other stuff already. I have all four of your other programs. I like them all, especially footwork drills. So I am excited to start this program. Please let me know. Thank You. Long time, no talk! Yes, you are definitely getting a discount on it. I’ve sent a message out to past customers. And will send you a direct one now. Hey Johnny! I’ve been saving up some money to buy this almost there, I bought the Dancers footwork for fighting about 2-3 months ago is there any way to get a slight discount on this price ? Thanks in advance looking forward to using this! Santiago, all previous customers can get a little more than a “slight” discount. 😉 Please email me directly! Thanks so much!! gunna go to the bank tomorrow to deposit some money and get registed! I’m pumped! Damn johny i feel like this is the black friday from your website, because of the deal you are giving us. It’s the best I could do. Thanks for your support, Alex! Thanks for commenting, Andrew. It’s a great product. At this moment, I’m not willing to sell it in pieces as that takes away from the entire product and also many techniques are built upon the understanding of previous concepts. So to watch random parts of it may feel incomplete and not be as helpful to you. I understand the price is high but for what you get, I think you’ll find it to be quite reasonable. For $295, you get to have ALL my products as well as lifetime access to all the members benefits and also all FUTURE products. I’ve been working a lot on my footwork and hooks. I feel good about my jab and cross, but my hooks feel really weak. Just watched your day 9 video today, and it alone is worth the cost of the program. Tried your body hook suggestion, and it’s so much better in terms of speed and power. Your tip on this really transformed my hook. Thank you for understanding, Andrew. And really excited to have you in there soon. Can’t wait to see how you do after trying it. I agree with Matt above, I got past the hook section and Johnny’s tip on how to visualize and execute the left hook alone is worth the entire price of the product. Amazing insight! This is pure gold. Keep up the Good work Johnny! Hi Johnny, quick question for you. Does the “Secrets to Punching Power” incorporates some of your exercises from your “Dancer’s Footwork for Fighters” instructional video? Thank you. It does cover some exercises that I also share in the “Dancer’s Footwork for Fighters” program, but also many more that are designed to help you strengthen your position while in place. Whereas the exercises in the footwork program are for movement. Ultimately, this wouldn’t matter since by purchasing “Secrets to Punching Power”, you get access to ALL my guides. So your saying if I buy the program I can access your other guides for free? Exactly Brian! If you buy StPP, you will get access to ALL my other premium guides (including all FUTURE premium guides), as well as access to the members-only video library, private members Facebook group, and other special features that I have in the works. Basically, for one price, you get lifetime access to all my premium benefits. Everything is free forever for you! Holy crap this is one hell of a deal. First, something that may very well be a pure GEM of a boxing program. Second, I get access to all boxing guides. If I had the money to spare right now I would be all over this. I will be buying this later though (especially since I plan on starting back boxing). Thank you Johnny. It IS a great deal. Hope you can be a part of the group, Teddy. WOW! Just by reading the topic list I learnt a lot. As soon as I have some money to spare, I’m taking this with both hands. Great job, Johnny! I appreciate the work you put in these educational and inspirational stuff, even the free material. Thanks a lot and keep it up! Hahaha, I was thinking the same when I wrote the topics. Thanks so much for the support, Ray. Hey Johnny, just wanted to say your videos have been a great investment. I was beginning to get burned out after 17 years on & off with boxing. I resort to law enforcement fights at my age. Anyhow, I’m on day 3 of your videos, I feel so much more motivation. Your knowledge is incredible. Keep punching. I’ll say it too, Johnny’s secret to punching power is fantastic. Hello everybody. I purchased this course and I gotta say IT IS AMAZING. There’s so much HELPFUL AND USEFUL material in this. So much stuff that I would have never guessed existed. Johnny teaches and explains to you so many useful and helpful stuff that even my trainers didn’t know. And it’s so much detailed. I’m on my vide 10 now and I already use all of the techniques in my training and sparring and I gotta say it WORKS. It’s totally worth the money and on top of that I got access to all the other products which is a GREAT bonus. I’m so satisfied and happy that I decided to purchase the course. Like literally guys, there’s so much precious information. Lol I got carried away a little. But I hope my comment would be helpful to those who’s hesitate to buy it. It is REALLY great! You ever see GGG, Kovalev, etc. throw a cool looking combo, go to your heavy bag to try it, and it just falls flat when you execute it? I had that feeling a lot. I’d watch pros fighting or working the bag in videos, and it just didn’t feel the same when I was throwing the same punches. What was I missing? I never really understood what people meant when they said a boxer used “good angles”, but Johnny does a great job of covering this and more. He taught variations to the simple 1-2-3 combo that transformed a once basic combo into a multi-use weapon. It’s a really great program with lessons that are best reviewed more than once. I got started with Johnny’s “How to box in 10 days”, and this is the next level in a big way. Hi everyone, I’m from Thailand and I’ve been training Muaythai(Thaiboxing) for 1 year. After I’ve read many tips from Johny, it has improved my boxing skill which I can adapt to my Muaythai but after I purchased this course which I think it’s not too expensive as you think because this course have developed my technique so much. Before I purchased it, I have only punching power but didn’t know how to land it. After I’ve watched his Secret Punching power suddenly, it makes me feel more relax, power, speed and many things which I can to adapt to Muaythai easily. I think if you are training martial arts this course will be very useful for you since you will have the punch that can knock people out easier. Just tried to use that “solid knee” method and must say that the diffrence is unbeliveble … much more solid and feel like i don’t have to catch my balance anymore … may sounds funny but visualizaction with the “metal shoe” helped a lot. As i said ive boxed for quite long time and been in competition for like last 6 years and its the aspect i whould never think off but obviesly seems to be very helpfull as by eliminating that over mobility i feel to have a lot more connection with the ground. Apart from that thank you so much for an advice . I can see your boxing knowladge is spectacular and that types of tips.which other coaches couldnt even think off. Thanks Johny u are the Expert . – Mouth breathing, Boy did my speed and endurance increase only by changing exhaling through nose to mouth! Awesome little nice detail! – Check hook, Absolutely beautiful tool in my box to annoy aggressive fellas by moving to side! – Overhand hook with lead hook, Absolutely devastating change when I threw that against opponents jab! Almost knocked out a heavyweight guy with 1 punch! – Lats awareness, my stance is much more grounded now that I know how to punch with back muscles and I am able to trade punches, knowing I have that sleepy sand in my punches! These are the things that I picked head on and found effective from start, probably I will find much more new things as I progress with your program! Really appreciate your work towards online coaching in boxing! Keep it going! Great post and I’ve noticed his tools have helped me with sparring. Absolutely great fast lessons that work! Day after advanced jabs session, guy comes to me and says, “your jab is fast dude”. I’m just thinking, thanks Johnny. June 9th I’ve got a Battle of Badges match. I’m feeling more confident from Johnny’s training videos. I’ll let you all know how it goes. The training videos have been helpful. I’ve been studying the membership page a lot too. Another good sparring day here in Boston. My buddy was asking how my left hook kept catching him. Told him to check out Expert Boxing. Why don’t you write about body punching? That’s on my TO-DO list, Curtis. hy should I have to give my card numbers to total unsolicited strangers ? If it is free? Hi Mike, I’m a little confused by your question. If you’re purchasing this instructional series from my site, the processing is handled by PayPal so nobody can see your info, not even me. When you say no special equipment does it mean I only need to do shadowboxing to learn all these techniques you detail here. And is the information seems overwhelming is there like a regimen we follow or we have to implement the techniques on our own. Hi Brian, when I say “no special equipment is needed” that means yes, you can learn all the techniques with just your bare hands and “shadowboxing” but it’s definitely most ideal if you can hit a heavy bag to feel the added power and speed. And also to have a sparring partner to test out the many striking angles that I cover in this guide. And yes, there is a structured flow throughout each day from one technique to the next. You work on one before moving to the other. You can go as quick or as slow as you like. Some things may come easier than others but the wealth of information is there for you to take advantage of at your own pace. You forgot to add in day 31 ” Heavy Deadlifting, Heavy Squatting and Heavy Curling (in the squat rack)” for optimal punching power……..j/k j/k j/k. Eventually I’ll be purchasing your instructional video, but I’m still working (lol although more like struggling) with the Dancer’s Footwork for Fighters. HAHAHAHA! Funny, David. Will be great to have you in the program! So we went there ands we did it ! 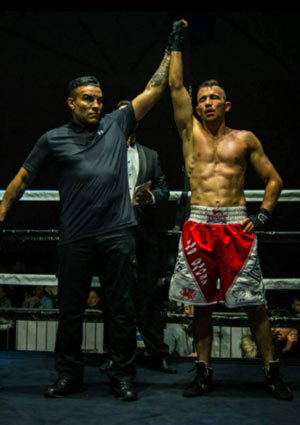 Another win on saturday night .. comfortable on points, won every round .. the reason why im posting it here as much of my success i would like to dedicate to Expertboxing as this is the main source of feedback and tips im getting from ! Thanks Johnny !! Hey Johnny Nguyen! I’d like to tell you that i’ve got much success when completing the stpp program, lots of good and precious info! Now my sights are set to autumn as i try to get 4 matches under my belt. First two are debuts in amateur boxing also known as smoker bouts. The latter two are 1 continental tournament, assumed to have boxers from finland and russia. The biggest is in late october, the finnish military boxing championships and i am pretty confident to go for the gold in that! Made the purchase. Thank you for your time and effort making these guides. I truly appreciate it. I’ve certainly felt my power and balance improve. SO THANKS, your information is great, just hope searching for feedback improves your products. Hey, Johnny, I’m loving all your content so far! I’m almost done with secrets of power punching and about to do the dancer’s footwork one. I like the gold membership. But can’t afford 295$ up front. Can a person pay into it to get gold. Not bronze payment plan. Thought I would ask. Thanks. Hi Oscar, not sure I understood your question. You DO want or you DON’T want a payment plan? I PayPal does have financing options if you have good credit. But either way, you could use all my free stuff while you save up. It’s an awesome package and I hope you get to be a part of it. Tons of exclusive content in there. Was there any chance of a special discount this coming December? I’m afraid there won’t be. The GOLD membership is doing well and the members are actually taking up a lot of my time with special video requests, video reviews, etc. If anything, I’m planning to increase the price soon. Yikes, better scrounge up money the funds for it. I’m wondering if there’s as much to boxing defense as there is to punching power… would you consider creating a defense course? I’m so happy to hear the course is doing wonders for your skills. I’m definitely scheming to put together an incredible boxing defense course that can make any beginner comfortable against the most aggressive opponents. Defense is a whole other can of worms and an entire science just by itself. And yes, the course will be absolutely free for you and all other EB gold members. Stay tuned, Andrew! I’ve been watching your channel for sometime now and find it really helpful. I wanted to purchase the Gold Membership but have a few questions. With Gold Membership will I get access to ALL future EB content? Say you were to come out with another footwork course, would I have access to it at no additional charge? Are the courses (footwork and punching power) downloadable? I ask because my internet is pretty bad so I prefer downloading whenever I have a good connection. Thanks for all the free material on Youtube. Excellent stuff man. Thanks for messaging me. It’s always great to hear from fellow boxers. So glad my Youtube videos were helpful for you. In regards to your questions…you understood everything exactly. You get access to ALL future EB content no matter what it is, new footwork, defense course, workout series, etc….all free and ALL DOWNLOADABLE! That’s awesome news! I’ll be getting the Gold today or tomorrow then. Thanks for the prompt reply. Thanks for all the effort you put in giving free boxing tips. I’ve found many of them very useful to improve. 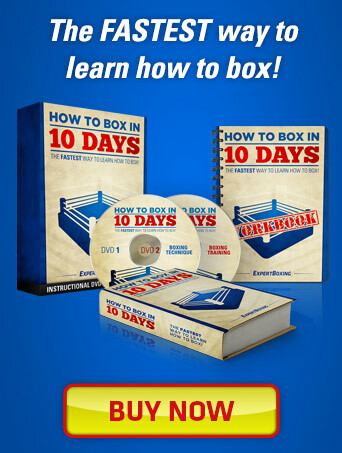 I am a beginner and I am not sure if this course fits my skills or if I need to get first a less advanced course from you as “how to box in 10 days”. This is an incredible course that does teach you the very basics of punching all the way up to the most advanced parts. Yes, you can use it as a beginner but it doesn’t teach you how to box. It doesn’t have defense, footwork, strategy, training, and all that. It focuses ONLY on punching technique. Ok thanks Johnny, I’ll ponder to buy it during upcoming months. Sorry, Dita. It’s higher than our minimum wage as well! Please save your money and use all the free resources I’ve made. Tons of articles and videos, also helpful Facebook group…all for free! Hi David, like everything else you’ve encountered in your life…the instructions are explained for right-handers but you could certainly re-interpret the instructions (as you’ve probably already learned how to do) and learn a great deal from this, yes. The mechanics are pretty much the same except now from the other side of your body. Other southpaws have purchased my courses as well and enjoyed them immensely. Wow! Just started to navigate through all the content and it’s amazing!